1. The creators of Fright Dome and Topgolf have teamed up for the Beer Witch Project through Oct. 27. 5 beer stations on the fourth floor will feature a special Halloween theme. Guests will enjoy tastings from bewitching brewers and there will be a costume contest Oct. 27. 2. Vintage Market Days are back Oct. 26-28 at Downtown Summerlin. The upscale vintage-inspired open market features upcycled antiques, vintage finds, unique clothing, consumable yummies, handmade treasures, home decor and more. 3. The Elysian Great Pumpkin Road Show is making a stop at The Park Vegas and New York-New York hotel casino from Oct. 26 to 28. The pumpkin-themed celebration will feature 50 different pumpkin beers. 4. The theme for this month's Last Friday, Just Add Water Street is "I Know What You Did Last Friday." There will be a skating rink, live music, art, food and beverages, and trick or treating. 5. Rock N Roll Tattoo on Boulder Highway will be doing special tattoos for Halloween and Day of the Dead from Oct. 26 through 28. Tattoos are $20 each, must get 2. Other restrictions apply. Free food and drinks, movies screens and costume contests. 6. Human Nature at The Venetian effortlessly blends retro cool classics with today's contemporary hits, bringing the ultimate jukebox party to audiences. Dark Sundays and Mondays. 7. The annual Dogtoberfest is happening Oct. 27 at Big Dog's Brewing Company. There will be 50 craft beers, tasty brats and other food, live music and more. 8. Bark-Andre Furry is hosting a Yappy Hour on Oct. 27 at Shake Shack at Downtown Summerlin. 25 percent of all sales donated to Nevada SPCA. There will also be dogs available for adoption, free poochini for all dogs in attendance, raffles and more. 9. Charleston Heights Arts Center is hosting a sugar skull workshop from 1 to 2 p.m. Oct. 27. Learn about the Mexican tradition of sugar skulls and create your own just in time for Dia de los Muertos holiday. 10. The Country 58 benefit concert is happening Oct. 27 at Henderson Pavilion. Performers include Chase Bryant and ELVIS Monroe. They will be joined by Sam Riddle, Michael Austin, Justin Carder, The Rhyolite Sound and Alyssa Oeder. 11. There will be 2 special Halloween-themed performances of "The Rocky Horror Picture Show" at 8 p.m. and midnight Oct. 27 at Regency Tropicana Cinemas. Also, there will be special preshows and costume contests. 12. Gilcrease Nature Sanctuary is inviting kids to trick-or-treat between 10 a.m. and 3 p.m. Oct. 28. There will also be a craft fair, special dance performances, food by Buster's Dawg House, silent auction, face painting and more. 13. The legendary rapper Tech N9NE is making an appearance at the new ZIA Records store on Oct. 28 before his performance at Brooklyn Bowl. Tech N9NE will also be introducing his new beer at Brooklyn Bowl. 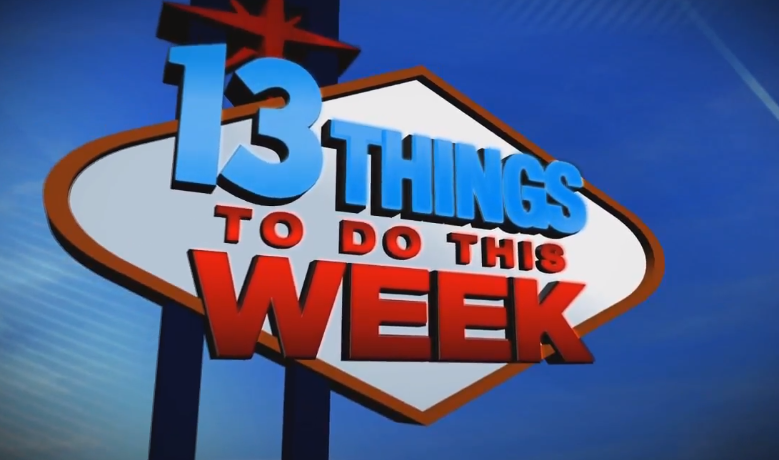 If you would like to submit an item for 13 Things, send an email with details and photos to joyce.lupiani@ktnv.com.